Chicken soup can warm your soul on a cloudy winter day. The chicken flavor and vegetables seep into the broth, which tastes incredible, especially if you're feeling under the weather. Boiled chicken, like the chicken you find in chicken noodle soup, has very similar nutritional content to regular roasted or fried chicken. If you're boiling chicken breast, chances are you're making it for nutrition more than taste. It's quite possibly the least flavorful way to cook chicken, but it's high in protein and low in fat, making it a tempting meal if you're trying to lose weight or build muscle. 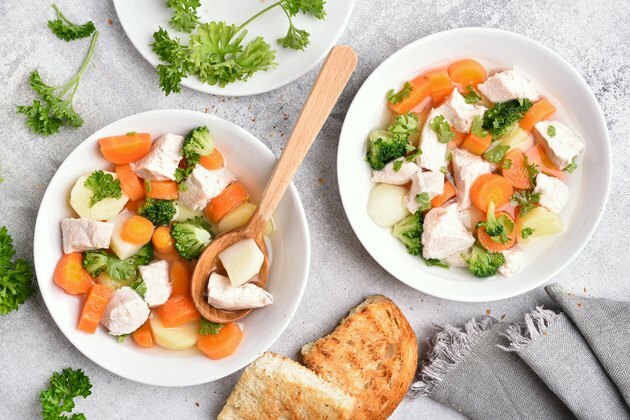 According to Spark People, one cup of boiled chicken has 202 calories. The calorie content of cooked chicken is low compared to the amount of protein. To put the number of calories in perspective, one bottle of popular cola contains 200 calories. Chicken is much more nutritious and filling than soda, so you shouldn't think twice about consuming 200 calories worth of chicken. Boiled chicken breast is as close as you can get to a pure protein source. It contains very little fat and zero carbohydrates. There are about four grams of fat in one cup of boiled chicken breast. That's as much fat as about eight almonds, according to nutrition facts from the USDA. One cup of boiled chicken breast contains a whopping 39 grams of protein. That's an incredible amount of protein for 200 calories. In fact, it gives one of the leading whey protein supplements a run for its money with only one less gram of protein for the same amount of calories. Even though it's impressive, boiling chicken can degrade protein more than other methods of cooking. It's only a slight difference, but oven-baked chicken breast contains 40 grams of protein, according to MyFitnessPal. One less gram of protein shouldn't be enough to dissuade you from boiling chicken. Boiled chicken breast contains trace amounts of vitamins and minerals. There are only a few that are noteworthy. Vitamin B6 and B3 are the two most prominent vitamins in boiled chicken breast. One cup of boiled chicken provides 22 percent of your daily value of B6 and 57 percent of your daily value of B3. There's also eight percent of your daily value of B2. Protein sources are usually the best place to find B-vitamins, according to an article from Medline Plus. B-vitamins help you extract energy from your food and form red blood cells. The biggest difference between boiled and baked chicken is that boiled chicken has high sodium content. This could be due to the fact that salt is used in water to boil chicken. There's about 520 milligrams of sodium in a cup of boiled chicken, compared to 148 milligrams in baked chicken.